New Orleans is without a doubt my favourite American city. When our friends Tim and Sarah came to visit last year Tim revealed over breakfast that he was going to celebrate his 60th birthday with a trip to New Orleans, their first time. The trip was paid for with air miles and an AMEX two-for-one companion voucher. Unbeknownst to me, Mary had her iPhone out under the table and was checking our air miles balance and reward flight availability. She held out the phone to me and I nodded. "Would you like us to join you? ", we enquired. They were delighted. And so it came to pass. We booked into the same hotel where we stayed on our very first visit, Le Richelieu, and the first booker recommended the second so we got a few dollars off. As we had been to New Orleans three times previously we were able to make suggestions and recommendations, revisiting places that we knew and discovering some new ones. 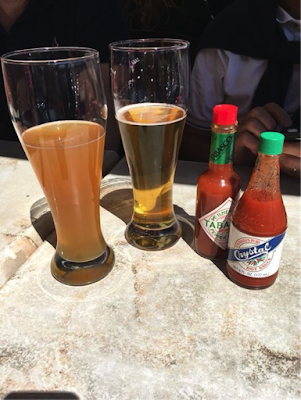 After the journey and impending jet lag we kept lunch simple at the French Market Cafe, a beer at the Crescent City Brewhouse and a bit of a rest. That evening we were off to the Palm Court Jazz Cafe for supper and music. We had booked way back and were expecting to see Tim Laughlin but unfortunately he had diary clash that evening and so was not appearing. Still we had a good time and rebooked for his next appearance which was while we were still in NOLA. We did a wander around the French Quarter to get Tim and Sarah oriented. Preservation Hall: music venue for trad jazz, possibly overrated. Madame John’s Legacy: A claimant to being the oldest building in New Orleans. Being Paddy's Day on Saturday there was already a lot of green being worn and two Paddy's Day parades, one on this Friday and another on the Saturday. We watched the parade and acquired some green beads to wear tomorrow. That evening we were off to Frenchman Street on the edge of the French Quarter for an excellent supper at a new discovery, Marigny Brasserie, and then to DBA's to listen to the Honey Island Swamp Band who play "bayou americana" style. 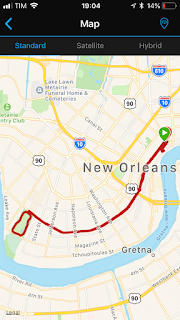 We took the streetcar out to the Garden District and picked a self-guided walking tour leaflet from Commander's Palace. We then proceeded to walk our little legs off looking at all the lovely old buildings. Supper at the previously visited EAT New Orleans. Lots of street music on the Sunday include a surprise appearance by a visiting band. They mingled in with the crowd and even invited the bride from a hen party to join the band. I couldn't help noticing the cheerful disregard for the "Church Quiet Zone" notice. We chanced upon the lovely Kingfish cocktail bar during happy hour and so had to stay for two. Then off to NOLA restaurant, one of New Orlean's finest. 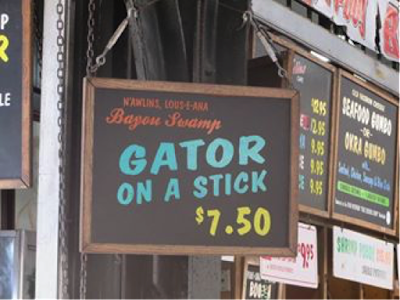 A swamp tour in high on the list of things to do in NOLA. 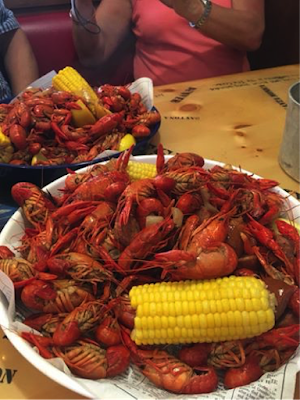 After all that eco tourism it was time for culinary tourism at another of NOLA's finest restaurants, K Paul's Louisiana Kitchen. As I was in training fo the London Marathon I couldn't relax even on holiday. 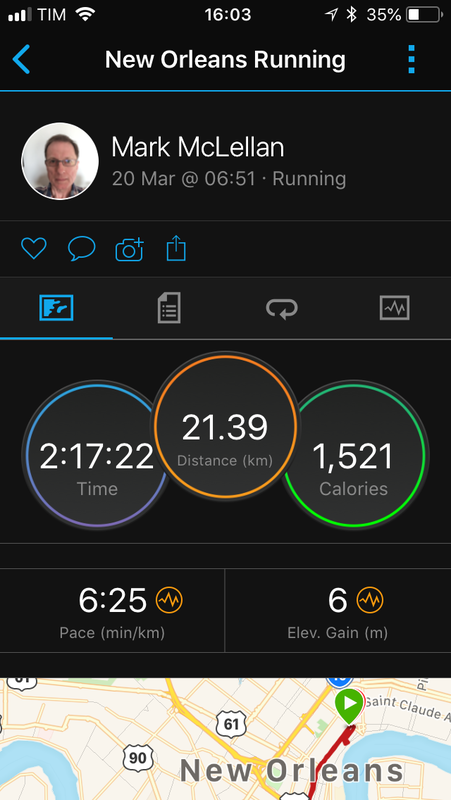 Up early thanks to the time difference and a quick half marathon before breakfast! 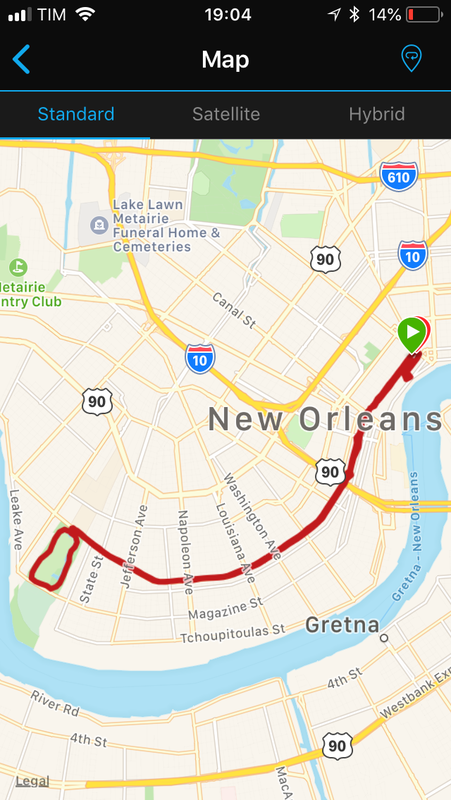 My route was out along the Saint Charles streetcar line, a circuit of Audubon Park and back to the hotel. The guy in the tourist office had suggested St Charles Avenue. What I had not realised was that joggers ran along the tracks, facing oncoming trolley cars of course, and would jump sideways when a car passed their way. So I did the same. 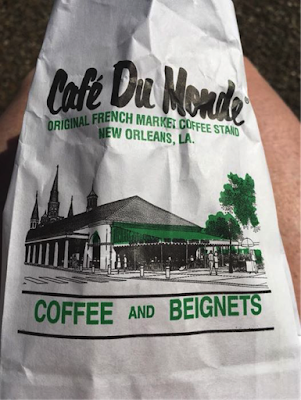 Then a relatively quiet day of tourism starting with coffee and beignets at Café Du Monde. That evening happy hour at Kingfish cocktail bar again then back to Marigny Brasserie for a meal with live music. New Orleans School of Cooking demonstration. There were tastings but still room for more so we went for a late lunch at Bubba Gump Shrimp Co. - boiled shrimps, not sophisticated dining but filling. Free blues concert in Lafayette Square. Free classical concert in St Louis Cathedral. Supper in Orleans Grapevine wine bar. 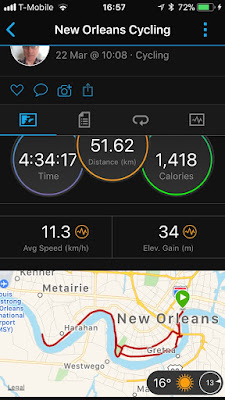 Cycling madness as we hired bikes with no gears and no brakes and went for long cycle along the levee. We were out for four and a half hours and cycled 32 miles. On the way back we passed through the Garden District for another look at the lovely architecture. Tim and Sarah went off to visit the World War II museum while we had a quiet day by the hotel pool. Back to the Palm Court Jazz Cafe to see Tim Laughlin and excellent seats as we had booked reasonably in advance. Then off to the airport and home. Boo! Sometime you go to a wine tasting event and lose your notes. That happened twice to me this week; this is the first. 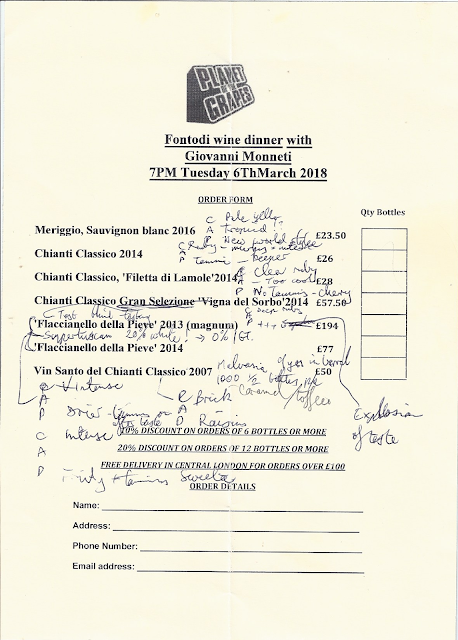 So all I am left with is a hazy recollection of a splendid meal present by the suave Signore Manetti himself, all Italian charm and a fund of stories about the estate and his family. Much more interesting than what you read on the back label. Update 25-April-2018: found my tasting notes. C=colour, A=aroma, P=Palate. Not worth transcribing. They are really only memory joggers for me and this long after the event not of much use. 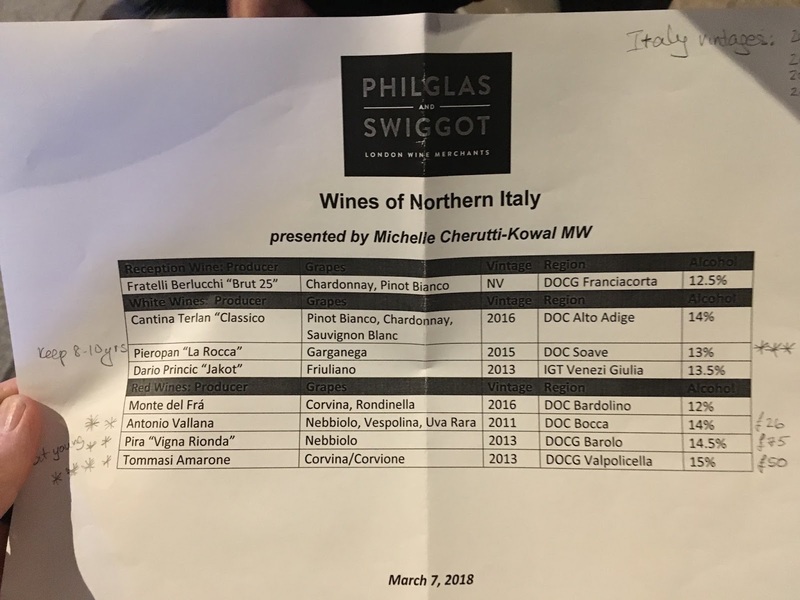 I would only highlight the Chianti Classico Gran Selezione ‘Vigna del Sorbo’ 2014 as the wine of the evening for me. It also does show the prices these wines can command. Below is the blurb provided by POTG and the menu. 2018 marks the fiftieth anniversary of the year that the Manetti family purchased the derelict estate in Panzano's Conca d'Oro (or golden shell); a natural amphitheater in the heart of Chianti's original 'Classico' zone. 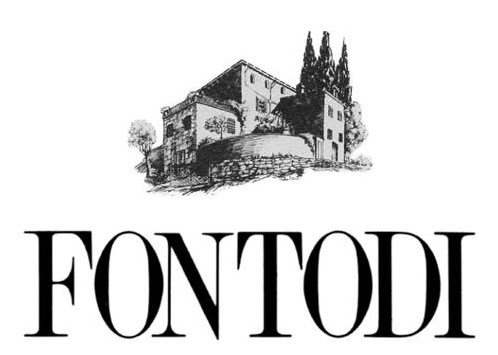 In that time Fontodi has risen to become one of the undisputed stars of the region, and Fontodi's wines are considered benchmarks for all of Tuscany. Fontodi's owner; the legendary Giovanni Manetti, will be at Planet of the Grapes Bow Lane to talk us through the history and philosophy of his estate, and to guide us through a stunning line-up of his wines; including two vintages of his flagship Flaccianello. Now that is what I called a meal - fantastic food and matching wines. Hic!